Kellogg School of Management is a nationally recognized top tier MBA program, however the challenge that exists is Kellogg is not always listed as a #1 choice for prospective students compared to its competitors. The primary audience for the Kellogg School of Management is top-tier, full-time traditional MBA prospects, who are 25-31 years old, with 2.5+ years of work experience and an avg. score of 680+ on the GMAT. The creative strategy is geared toward the driven achievers that embody the spirit of the Kellogg prospect. 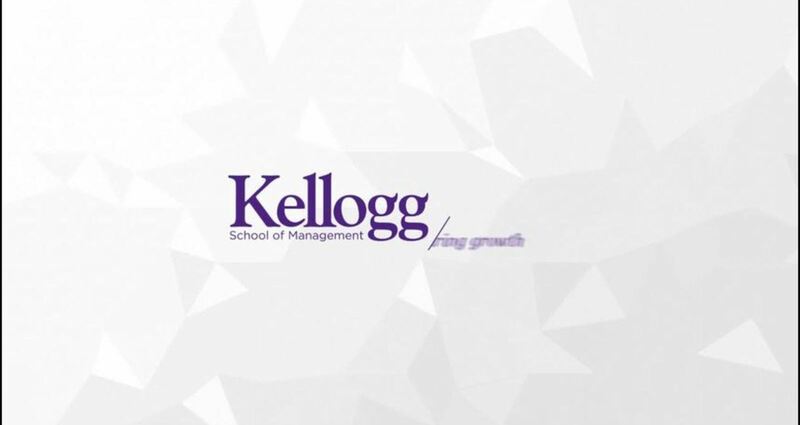 The organizing idea is that Kellogg develops courageous leaders who can identify, inspire and ignite lasting growth in people, organizations and markets. 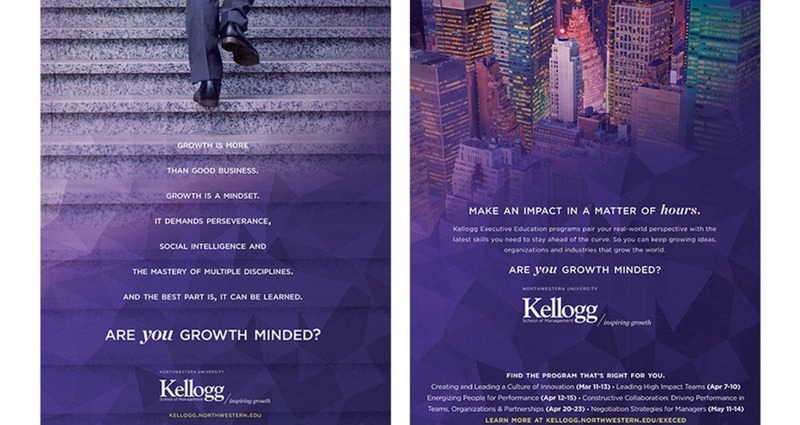 Thru a complete branding redesign, Kellogg re-launched with a new identity geared towards the idea of being “Growth Minded”. 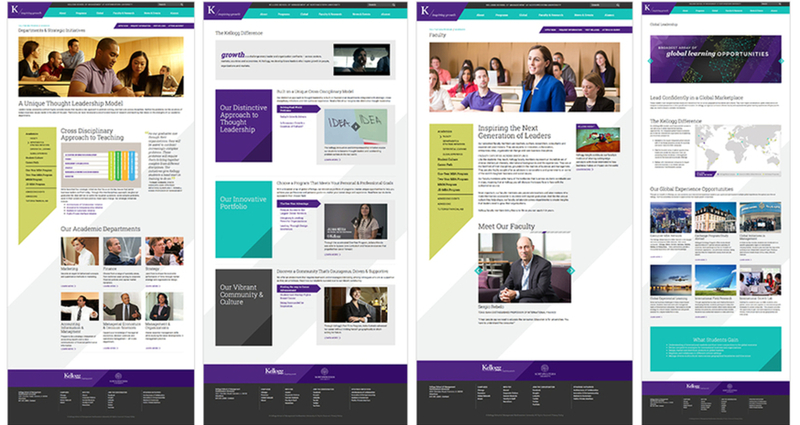 The new creative strategy and design was rolled out thru Kellogg’s website, online advertising, print as well as internal communications on campus. 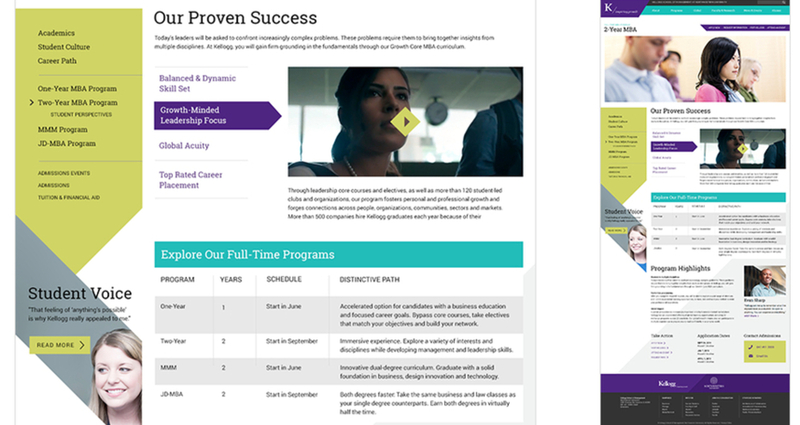 The strategy behind the work is grounded in this insight: Kellogg prospects are driven achievers, the best of the best. What they really want is to make a dent on the world – to be in a program that gives them the tools to grow and thrive personally and professionally. In today’s economy, this means being able to see and to seize possibilities others do not, embracing challenges and persisting through barriers. Growth is about learning from mistakes, working hard and being inspired by others’ successes. This requires a certain kind of mind – one that is flexible, creative, daring, visionary, and collaborative. It takes non-linear thinking and challenging the status quo. We call it being growth minded. We use Organizing ideas as jumping off points to create experiences at the intersection of technology and storytelling. Organizing ideas embody how a brand should behave. For Kellogg, our idea was: Develop courageous leaders who can identify, inspire and ignite lasting growth in people, organizations and markets. 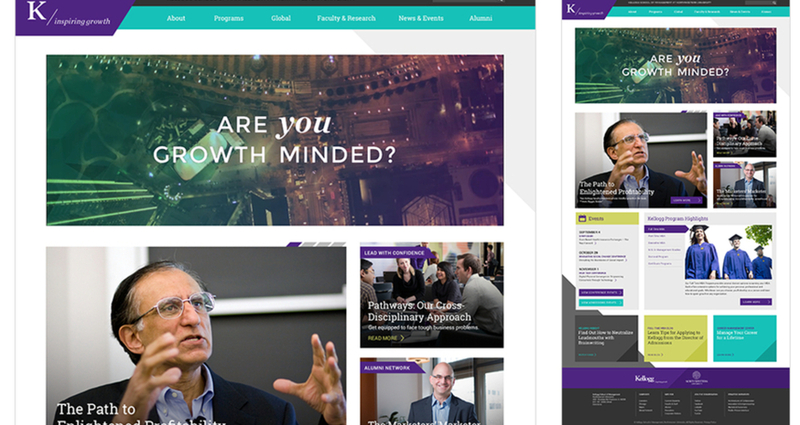 The marketing challenge for the Kellogg School of Management is that they get credit for their top-tier marketing expertise but not for being cutting edge, distinctive or having the same passion for personal & professional growth as their competitors. Because of that, Kellogg School of Management is not the first choice for enough top-tier applicants. Only 14% named it as their “first choice”, compared to 50% and 46% for their competitors. Consideration and application levels, however, are relatively close, so Kellogg School of Management is within striking distance. The primary audience for the Kellogg School of Management is top-tier, full-time traditional MBA prospects who are 25-31 years old, have 2.5+ years of work experience and scored 680+ (on average) on the GMAT. Additional audiences are faculty, alumni and current students. 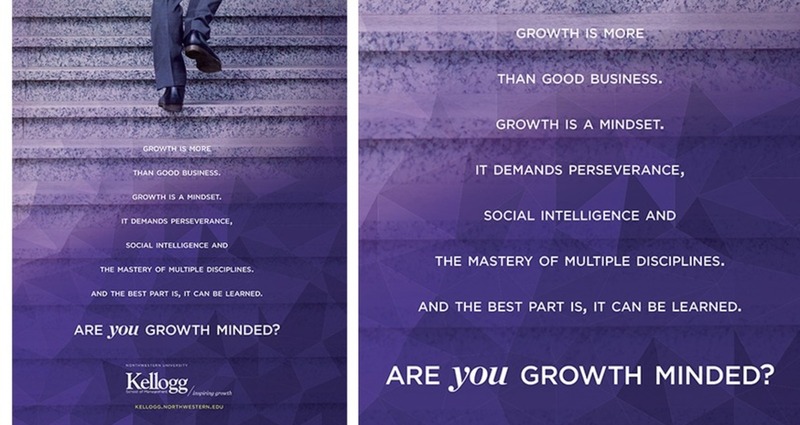 Kellogg School of Management: Are you growth minded?